What happens when pop culture enthusiasts from different generations swap tales of their favorite modern and classic stories? Let Your Geek Sideshow presents… Then & Now– a pop culture podcast! Press play above to listen along! Janet van Dyne, the socialite daughter of the scientist Vernon van Dyne, first became a hero in order to avenge the untimely death of her father following an experiment gone awry. 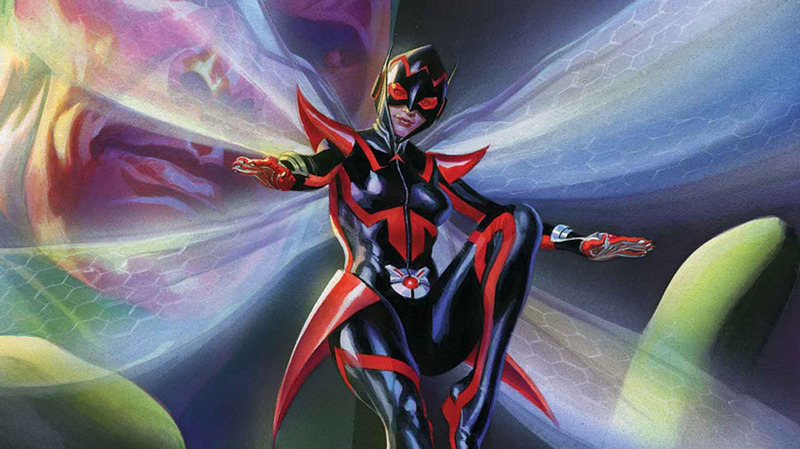 With the help of Vernon’s associate Hank Pym, she was given wings, stings, and the power to shrink herself down to the size of an insect- thus, the Wasp was born! Since that time, she became a founding member of the Avengers, and even came up with the team’s legendary name herself. Janet became a team leader, serving as the first female chairperson of the Avengers, recruiting members like Monica Rambeau and She-Hulk to the super group. In 2016, a new Wasp took the stage, as the estranged daughter of Hank Pym made her debut. Nadia Pym is the daughter of Hank and his ill-fated first wife Maria Trovaya, who grew up in the Red Room in Russia. Her brilliant and quirky scientific mind yearned for fulfillment, and by herself, Nadia successfully replicated the Pym Particle, which allowed her to escape captivity and go to America in search of connecting with her father. Finding that Dr. Pym had sacrificed himself in a new fight against Ultron, Nadia quickly became drawn to her stepmother Janet van Dyne, learning from the Avenger and eventually becoming the all-new, unstoppable Wasp. In the Marvel Cinematic Universe, Janet van Dyne cast a large shadow when she sacrificed herself and went subatomic to stop a bomb. Shrinking down so small that she entered the Quantum Realm, Janet was lost for 30 years when Scott Lang stole the Ant-Man suit and first met Hank and Hope Pym. This podcast is Ant-Man and the Wasp spoiler-free, so listen along and then be sure to see the film for yourself to learn more about Hope and Janet, and the Wasp as a hero in the MCU. You can check out the full Then & Now podcast on iTunes, or subscribe to our Youtube channel. Keep an eye out for new episodes and more ways to listen coming soon. If you like the show, be sure to subscribe and leave a 5-star review so that other fans can find the podcast! What comic characters or events would you like to see covered in upcoming episodes? Let Your Geek Sideshow and tell us in the comments! The First Look at Shazam's Movie Costume, the Y: The Last Man Cast Announced, and More! Unused Alien 3 Script Gets the Comics Treatment, Joaquin Phoenix's Joker Film Moves Forward, and More!